With senior officers of the Army coming under a scanner in the case relating to an attempt to transfer of a major chunk of land adjoining the military cantonment to a private trust in the Eastern Sector, credibility of the armed forces has taken a further hit. There is no doubt that the Army Court of Inquiry into the incident is not yet complete and the media appears to have come to premature conclusions. But the very fact that such senior officers of the rank of Lieutenant General are under the scanner is a cause of concern. One of them occupies the pivotal post of Military Secretary. The MS is one of those who reports directly to the Army Chief and is a Principal Staff Officer (which allows him to interact with various ministries on behalf of the Army). Moreover, his office is responsible for all the postings and transfers in the fauj. If the person at that post is facing inquiries, how is he supposed to inspire confidence in his choice of postings and transfers? Moreover, if reports of an officer approved to be the Deputy Chief, which is also a PSO appointment, besides a Corps Commander are under a cloud, it can be averred that there is need for greater scrutiny for appointments to top jobs. The two Deputy Chiefs are responsible for systems, training and acquisition of military equipment. Imagine, some of these are people who have commanded corps headquarters, which are the highest fighting formations. Most Army officers are quick to defend their brother officers facing inquiries. The other day in a discussion on CNN-IBN news channel, where I too was invited, a senior army officer said that this particular case was an isolated one and the situation was far worse in the civil. Undoubtedly, if you compare the forces with the environment around them and other services, their credibility is still phenomenal. But, then, if you compare the armed forces today with what they were four decades back, their credibility has taken a nose dive over the years. And it is this reputation and ethos that the armed forces, which are the last instrument of state policy, should be concerned about. The question often asked is: how has the credibility taken a nose dive over the years? Besides issues within the armed forces, apathy on the part of successive governments on their pay, perks, and status has affected the morale of the rank and file. Armed forces are not attracting the best talent to the officers’ cadre. Defence officers have started looking at other ways to either enrich themselves or seek after-retirement jobs. The latter appears to be the case here. What needs to be done? One, there is need, as I said, for greater scrutiny for appointment to higher ranks. Two, greater empathy on the part of the government to the requirements of the armed forces. This will ensure that their morale remains high. Three, the stipulation of the two-year cooling-off period after retirement for taking up any civilian job, should be strictly enforced. This should apply to even the Army Chief and also government jobs such as ambassadors and governors. This will ensure that they have nothing but the wellbeing of the armed forces in mind while they don the uniform. The reported move to revert to the Chief Commissioner system in the Union Territory of Chandigarh is a retrograde step. That it should be linked to the recent controversies relating to the Chandigarh Administration would be missing the bigger picture – like the proverbial wood for the trees. There is little doubt that some of the controversies are the result of a faulty system of administration in the city. You have an Administrator for Chandigarh whose powers and responsibilities are unclear, especially vis-à-vis the Union Ministry of Home Affairs. The fact that the Administrator is also the Governor of Punjab further confounds this confusion, especially in respect of the jurisdiction of courts (on powers of the Administrator). The confusion has only helped feed egos of its functionaries. But does that mean that UT should go back to the Chief Commissioner system? Certain people with lack of basic understanding of governance have been pushing this concept. Where on earth is a bureaucratic system the answer? Remember the days when the city had Chief Commissioner…. status quo prevailed for nearly three decades. And there were no dearth of scams (remember the infamous lottery scam? ), despite there being only a handful of media persons around then to unearth them. Do we want that? And should a Chief Commissioner not work out, would you bring in a Police Commissioner? The need is correct the fault lines in the system by bringing in a more democratic system. The Chandigarh Municipal Corporation, despite its lack of powers, has shown that the City is now ready for a more vibrant democracy – like Delhi, Goa and other places. This is all the more important since the noise about its political fate (of being transferred to Punjab or Haryana) is no more than symbolic now. It is high time that not just the political parties but the sector associations and other social groups get together to empower themselves. Since Chandigarh’s size could be an issue to replicate the city state concept, the democratic system could be specially customized for it. A Committee of Parliamentarians and others could be asked to chalk out the system suitable for it. Of course, since Chandigarh is a highly planned city, there would be fears that a democratic system could undermine its basic concept, architect and planning – even to the extent of destroying it. These fears are legitimate. But there is a way around this issue. Certain basic concepts (like height of buildings, fate of its villages etc) could be spelt out in the form of a Statute, which could be altered only with Parliamentary approval. The system of governance in Chandigarh surely needs to change but the way to go is forward and not backward. In a little over two years, sectarian violence has engulfed Punjab and certain areas of Haryana for the second time. Hopefully, like the previous incident, this incident too would be brought under control. Yet, this once again underlines the explosive nature of the caste divide that permeates Punjab. Recurrence of such incidents at frequent intervals bring back horrendous memories of the late 1970s when sectarian violence concerning Nirnkari sect spiraled a bloody phase of terrorism in the border state. While two years ago, it was Sirsa-based Dera Sacha Sauda which was at the centre of the controversy, this time it is the 109-year old Dera Sachkhand Ballan. The provocation for the violence in Punjab was the armed attack on the dera head, Sant Niranjan Dass and his deputy, Sant Ramanand in Vienna (Austria) on May 24, 2009. The two leaders who were in Austria to conduct a special service were attacked by persons reportedly affiliated to another Sikh gurdwara in Austria. While Ramanand succumbed to his injuries the following day, Niranjan Dass is recuperating from gunshot wounds in a Vienna hospital. Though full details of the incident and details of the identity of the attackers is not known, the incident does reflect a failure on the part of the Indian diplomatic mission in Austria, which should have been alive to the simmering differences between Sikh groups in that area. Moreover, in the wake of the possible fall out in Punjab, it should have sounded an alert back home as soon as the incident took place. Had the Government in Punjab been alerted well in time, the people could have woken up on Monday morning with curfew in the affected areas. Failure to do resulted in government property running into several crores having been damaged in Punjab alone. Although the tenth Guru of the Sikhs, Guru Gobind Singh, who founded the Khalsa, having included all sections of the society, including the Dalits into the Sikh fold, sectarian divide is most pronounced in Sikhism today. There are more than two dozen sects and nearly a 100 deras in the region, who owe allegiance to Sikhism in some form of another, but have their own distinguishing characteristics. Many of them have living Gurus, which is anathema to mainstream Sikhs, who consider the holy book, Guru Granth Sahib as the Guru ordained. One such sect is Dera Sachkhand, which was originally called Dera Shri 108 Sant Sarwan Dass Ji Maharaj Sachkhand. Its followers (Ravidassi Sikhs) adhere to the teachings of Sant Ravidas, a 15th century untouchable preacher, whose “bani” (teachings), like that of many other preachers cutting across different religions of that time, form a part of the Guru Granth Sahib. Yet, when discrimination against the dalits continued in Sikh gurdwaras, separate Ravidas gurdwaras started surfacing in the middle of the 20th century, where portraits of Guru Ravidas are also displayed. According to one estimate there are as many 75 gurdwaras of Ravidassias abroad. Mainstream Sikhs, especially the radical elements among them, are piqued with Dera Sach Khand on a number of counts. Most Ravidassias, who don’t sport a turban, refer to most of their religious places as “gurdwaras”, where the Guru Granth Sahib is worshipped. The first time, tension between Ravidassias and others cropped up was in Tallan village in Jalandhar district of Punjab in 2003. Earlier, ideological differences cropped up when dera followers started believing in a living Guru - Sant Niranjan Dass enjoys that status now – an issue on which Sikhs are extremely touchy. Earlier, differences with Dera Sacha Sauda came to the fore when its head, Ram Rahim Singh was accused by Sikh groups of trying to copy Guru Gobind Singh in dress and form. Incidentally, the mainstay of most of the other deras and sects that have cropped up in Sikhism are either the dalits or the poorer sections of people. Dalits form nearly 30 per cent of the population in Punjab. Among the reasons for mass appeal of these deras are the charitable institutions like hospitals and schools being run by them. Since these deras also lay emphasis on education of children and condemn child marriage and drug abuse, they are seen by the poor as a panacea for their misfortunes. Properties of these sects dot not just Punjab but almost all states in North India. Moreover, they are liberal on the form of Sikhism that they practice. Political observers in Punjab feel that the recent incident should act as a wake up call to the government and religious organizations like the Shiromani Gurdwara Prabandhak Committee (SGPC) to not just take remedial measures but start the process of social reconstruction in the state. If today it is Dera Sachkhand that is at cross roads, tomorrow it could be another sect. Sikh scholars for long have argued on the need to take all sects into the wider fold of Sikhism. However, there were few takers on his advice. Later, when the Nirankari sect clashed with the Sikh groups in late 1970s, efforts were initiated to bring about reconciliation. But these efforts did not fructify. SGPC has been cagey on initiating reforms for the fear of drawing flak from the radical elements. Also, SGPC leaders feel that any relaxation of norms on Sikh identity and form could weaken the identity of the Khalsa and would result in more people opting out of the form of Sikhism as ordained by the 10th Guru. Another underlying reason for the SGPC dillydallying on introducing reforms and providing acceptability to other sects is the fear that it could drastically alter the power equation within the SGPC, which is acting as a handmaiden of the Shiromani Akali Dal (Badal) in Punjab. In this they see power slipping out of their grips. SGPC is already out of reckoning in the Sikh gurdwara politics in Delhi and the demand to have a separate gurdwara body in Haryana is growing. As Sikhs settle down in different parts of the world, independent streaks are becoming more pronounced. For example, a gurdwara in Europe has decided to make alterations in the ardas (daily Sikh prayer), which is being resented by the SGPC leaders. Another factor which could further widen the schism is continuing separatist tendency among powerful sections of the Sikh Diaspora abroad. In many places abroad, especially Canada, gurdwaras are controlled by radical Sikhs. Some of them left the Indian shores long ago and have failed to keep track of developments back home. Many left Punjab at the height of militancy when there was a crackdown by the security forces, forcing them to seek political asylum abroad. This includes a number of countries in Europe. This has a great destabilizing factor, especially when there is comparative peace back home in Punjab, as in the recent case. Fortunately, Punjab has come a long way since the earlier phase of violence when politics – both at the Centre and in the state – added fuel to the fire, unmindful of the suicidal consequences. Now, the Congress/ UPA Government at the Centre and the SAD/BJP Government in Punjab appear to be wise to the dangerous consequences if they play with fire. People often wonder why the Sikh community continues to be angry with the Congress party. This question hit the headlines once again when a Sikh journalist, Jarnail Singh, hurled his shoe at the Union Home Minister, P. Chidambaram, during a press conference in New Delhi on Tuesday. Perhaps, if one looks at the sequence of events for the past 25 years, the answer to the question is obvious. In our context, the anger of any and every community which feels wronged is justified – it is the Sikhs on 1984 anti-Sikh violence, the Muslims on Godhra in Gujarat and so on. The anger is against the system – or a lack of system – of the Rule of Law not being followed for years. If you don’t follow the Rule of Law, the anger – justified or not - will manifest in various ways – as has been happening in our country and globally. It is in this context that the Sikh anger against the Congress should be seen. This is irrespective of the incident involving the shoe being hurled – an issue on which as a journalist I have different and strong views. The community is angry because of the way the Congress has conducted itself. In the case of Jagdish Tytler, the party has not only given him a ticket all these years because of the “winnability” factor but also given him ministerial berths. Since this happened when he was facing inquiries, this obviously gives the impression to the community that he is being protected by the party. The timing of the CBI clean chit is also very odd – why could the CBI not give its report a few months ago or a few months hence? This gives the impression to an aggrieved community that the party is deliberately rubbing salt on their wounds. I would say that since the Election Commission has been pulling up various state government, ministers and officers, it should even look at the prosecution powers of agencies like the CBI and the state vigilance commissions in the run up to the polls. It is another matter that in this case the whole game plan – if there was one - appears to have boomeranged. I am not sure if the BJP can claim much credit either on the issue of violence against Sikhs in 1984. The party did initiate some fresh inquiries but in concrete terms ended up doing little to take the guilty to task when in power. Mind you, the incident is 25 years old. Isn’t it a shame on the Rule of Law that we claim to profess and practice? BJP also has much to explain on Godhra violence in 2002. On Tuesday evening, I was invited to a panel discussion on CNN IBN, where Sagarika Ghosh, who was anchoring the programme, asked me how felt on the shoe throwing incident. “Do you see yourself as a Sikh first or as a Journalist first,” she asked? I told her that I saw no contradiction in being a Sikh and a Journalist at the same time. While giving my view on the anger of Sikhs against the Congress, I told her that I strongly disapproved of the shoe throwing incident. Undoubtedly, journalists are mirror images of the society to which they belong and in which they live and on which they report, but they have a medium to express themselves. They can’t and should not take advantage of the ring side view of the events – howsoever, painful the events are. If they do that they would lose the special privileges they enjoy in the performance of their job. Besides, they lose credibility. While there is onus on the journalistic community to ensure that its brethren conduct themselves professionally, the governments are bound by the Constitution to ensure a Rule of Law, which is unsparing, transparent and time bound. Tuesday’s incident reflected a failure of both. Though the Army authorities would oppose any move to revoke the Armed Forces Special Powers Act (AFSPA) and Disturbed Areas Act in the state of Jammu & Kashmir, they are themselves to blame for the present impasse. The Chief Minister, Omar Abdullah has been under pressure to revoke the special powers and legal immunity provided to the security forces, especially after the death of two youths in Sopore in February, 2009. Besides various political parties like the PDP and CPM, human rights organizations too have been demanding scrapping of the special powers. State Government’s recommendation notwithstanding, the final decision on whether to continue with the Act or to scrap it remains with the Union Government. AFSPA was imposed way back in July, 1990 during Governor Jagmohan’s rule and though it was intended to remain in force for a short duration, it has remained in force ever since, with successive state governments continuing with it – apparently due to continuing terrorism. Besides Army officials, most security analysts are of the view that Special Powers and immunity against prosecution has helped the security forces to contain terrorism in the Valley. As some one who has followed Kashmir developments closely for the past few years, I agree that Army can’t fight the scourge of terrorism with its hands tied behind its back. The security forces have been faced with this low intensity conflict for nearly two decades now. Whatever the causes of terrorism in the Valley, since the movement has sustained because of the support from across the border, the Army needs extraordinary powers to quell it. But in the process what the Army authorities have ignored is the fact that the Special Powers Act provides them immunity for only bonafide operational acts. Some borderline cases could also come within the realm of being called bonafide. But security forces have been taking protection of the Act to gloss over even actions of its officers and jawans which were anything but bonafide. The infamous Pathribal case is one such example. CBI investigations brought out that five Army officers were among those involved in the killing of five innocent Kashmiris in a fake encounter to falsely claim that the militants responsible for the Chittisingh Pora incident of March 20, 2000 had been eliminated. In case the Army insists on immunity under the Special Powers Act, its top brass should come down severely on its personnel found guilty of such acts. And to come clean in public eyes, this system should be absolutely transparent. The public in J&K, whose cooperation the Army seeks, have a right to know the action the Army authorities have taken against the guilty of Pathribal - and now Sopore? In no case should Special Powers Act be used to protect rogue officers. If you do so, demands for scrapping the Act would only increase in the coming days. The recent developments at home and in our immediate vicinity raise serious security and foreign policy concerns. The string of violent incidents having nation-wide concerns started with the 26/11 Mumbai terror attacks. These were followed by the attacks on the Sri Lankan cricketers in Lahore last month. The developments on India’s eastern borders, where the Bangladesh Government is still coming to terms with the mutiny by the Bangladesh Rifles (BDR) troopers last month, is worrisome. And due to its possible spillover effect in Tamil Nadu, India is watching with interest the situation in Sri Lanka where the Government and the LTTE are engaged in a do and die battle. What has further added to the alarm in our security establishment is the worsening political situation in different parts of Pakistan. India is keeping its fingers crossed on the likely fallout of the long march slated for March 16 in Pakistan. All these developments, which political commentators are calling a “ring of fire” around India, could not have come at a more inopportune time. The country is in the process of getting into the election mode, which would engage all political parties for the next two and a half months. One hopes the volatile situation around us does not have a direct bearing on the poll process. The Government is of course alive to the highly unsettled conditions all around it and on Thursday, the prime Minister chaired a meeting of the Cabinet Committee on Security. There is also no doubt that systems are in place to ward off eventualities that may arise during the interregnum period of government change. But a new security doctrine would have to wait. What is evident on each of the frontiers may be only the tip of the iceberg. For example, in Bangladesh, there is increasing evidence of the mutiny by the BDR troopers to have been politically driven. Since the troopers were supported by fundamentalist elements, they could be trying to destabilize the newly elected Prime Minister, with implications across the border. Down south in Sri Lanka, the LTTE, who were talking from a position of strength in negotiations with the Government till recently, are all but cornered. In case the LTTE elements are forced to disperse and wage guerrilla warfare, India will have to step up its vigil in the sea adjoining Tamil Nadu to keep them at bay. Up in the North, the political situation in Nepal continues to be uncertain. This is bound to have an impact on India with which it has an open border, especially in the terai areas. In the wake of differences between the Army and the Maoists on integrating Maoist cadres in its rank and file, there is a danger of some of these elements trying to infiltrate across to foment trouble in India. Of course the most worrisome is not just the worsening situation in Pakistan but the gradual inching forward of the Taliban elements in the North-West Frontier Province (NWFP). The decision of the Pakistan Government to strike a deal with the Taliban in the restive Swat Valley of NWFP is rife with long-term security implications. Not only is Swat just 160 km from Pak capital of Islamabad but it is adjoining the Northern Areas of Pakistan, which link up Pakistan Occupied Kashmir and J&K. At this point, Kashmir Valley may be quiet but it continues to fester. And the security implications of the situation in each of these places – Pakistan, Bangladesh, Sri Lanka and Nepal – should be seen in the light of our ongoing border dispute with China. Unfortunately despite the country facing an unprecedented security crisis on its borders, none of political parties have so far factored any of these concerns in their election manifesto. Though comparisons are not accurate but during the recent election of the US President, foreign policy issues like Iraq and Afghanistan were among the main talking points. India may not have any global ambitions but its immediate vicinity remains its primary concern. One hopes that in the televised and media debates, political leaders are forced to spell out their party policies on the border dispute (and solution) with China and the possible resolution to Kashmir imbroglio, which, like other issues have a direct bearing on national security and politics of states which border them. Such debates will eventually help frame a viable national security doctrine, which now is not only hazy but devoid of the basic structure. In the aftermath of 26/11, the process of setting up a national security agency has been speeded up. Similarly, the process of creating NSG hubs in different parts of the country is underway. But these measures are but half way houses in putting together a national security infrastructure, which would pre-empt and effectively deal with security threats. A slew of measures are necessary. For example, there is need to seal not just the coastal areas but also the land borders, which are still porous, especially with Nepal. Similarly, the long-standing demand of the armed forces to have a coordinated agency in the form of a Chief of Defence Staff for proper and timely response to border hostilities ought to be expedited. Although nuclear weapons as means of resolving issues are unimaginable, with two of our immediate neighbours being nuclear weapon states, a viable command and control structure is imperative to have a credible nuclear and security doctrine. An unfortunate fallout of the Mumbai 26/11 terrorist attack has been that various points of friction between different government agencies, including security forces, that have been festering for long have come into the open. These range from functional issues of command and control to after-effects of the sordid incident in form of awards and rewards. At the same time, old issues of turf, pay and allowances have also come to the fore. A number of retired Army officers have openly aired their views on these issues in the media and also taken to holding protests and rallies. The civilian officers too are angry at efforts to belittle their contribution. All this points to increasing differences between the Army and civilians. Since both sides accuse the other of seeking their own advantage, the issues ought to be discussed threadbare at the highest forums of the government. The alarming security environment around us underlines the need to act quickly. These ought to be the top priority of the incoming government at the Centre. Every career has its peculiarities and is as important as another. But the very fact that the family tradition of a military career is all but withering away and the youth no longer prefer a military career only underlines the fact that neither the peculiarities of the job nor its importance is recognized any more. The very fact that defence personnel, irrespective of the rank, invariably seek second or third jobs after retirement, points to their pecuniary condition. 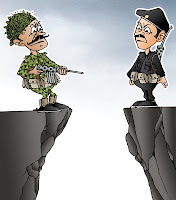 The inequalities in emoluments and status lead to squabbles between the soldiers and civilians also because with the nation in turmoil due to disturbed internal security environment, they are often called upon to rub shoulders with one another. The lowering of protocol equations of the Army officers via-a-vis the civil servants is a cause of friction, especially when the Army takes control of a situation in aid of civil power. In many cases, the government’s lack of foresight has added to this friction. For the prestigious National Defence College (NDC), or example, while usually defence officers with at least 25 to 30 years service are selected, the civilian officers selected for the same course have less than half the service. In the past, this often created a piquant situation when some of the civilian officers sent for the course were ex-short service Army officers! Although defence services too have unfortunately got into the rat race of ranks but their efforts pale before their civilian counterparts. Today, in the order of precedence, not only is a Corps Commander (an officer in the rank of Lt General) and in command of more than 50,000 troops, placed below the state Director General of Police but to all those holding that rank – some states have as many as one dozen DGPs! So also in awards and decorations. Even in the defence services, the VSM series have been devalued and many senior officers have been given these for doing their basic job. Even in the awards for gallantry, Siachen and Kargil came in for special dispensation, despite limited opposition from the enemy. Against three Param Vir Chakra (PVC) in the 1962 war with China, two against Pakistan in 1975 and four during the 1971 war, as many as six PVCs were awarded during the clashes in Siachen and intrusions in Kargil. But this is even more glaring when one looks at the 11 Ashok Chakras (peacetime equivalent of PVC) awarded in the last one year for Mumbai and other incidents. Both these awards – PVC and AC - are not for “putting oneself in the harm’s way”, but for “most conspicuous bravery or an act of daring or pre-eminent valour or self-sacrifice….”. Unfortunately, when governments try to make up for their own failures in preventing such attacks or intrusions with liberal dispensation of awards, they undermine the very act of valour - and the awards. The grudge of the armed forces for having been downgraded in emoluments and status is not without reason. Had successive governments set up separate Pay Commissions for the armed forces or at least ensured their fair representation in the combined Pay Commissions, as demanded, this grudge may have been redressed. Unfortunately, in denying this, the governments failed to recognize the unique place that the Constitution provides to the armed forces. Unlike any other service in the country, the basic fundamental right of speech and expression of a man in olive green is abridged. For example, while a serving IPS officer could air his views in the media on the issues under discussion by calling them his personal views, no defence personnel can do so. This “denial” of rights to the man in olive green, which distinguishes him from other uniforms, is not without reason. Being the nation's last resort, the armed forces have to be "empowered" to deal with any eventuality. To do so, the old thumb rule as penned down by Lord Tennyson in "The Charge of the Light Brigade" still hold good ("Their's not to reason why; Their's but to do and die"). Of course, this "empowerment" ought to be subject to certain foolproof in-built checks, lest some overzealous elements in uniform resort of adventurism. But, this abundant caution should not result in their neglect. Since the Army rank and file is feeling belittled, this is rife with serious implications. It could invite an angry and violent reaction from within its rank and file. Fortunately, the apolitical nature of the Army and the service ethos is holding up. But, at the same time, it could result in demoralization. Either way, the nation would be the loser. If egalitarian values and civilian functioning have to take precedence over somewhat archaic and chivalric values of the military, the military usage has to be minimized not only in dealing with neighbours but also internal disturbances. The only way to "cut the military to size" is to strengthen the democratic value system of equality and social justice. Till such time the armed forces remain fundamental to the nation's entity, they have to be cared for. Born in Rajasthan in a military-farming family, my schooling is from The Punjab Public School, Nabha. I did my Masters in English Literature and then took Bachelor’s degree in Journalism from Panjab University, Chandigarh. Having worked in The Tribune, Indian Express, Sunday Observer, and India Today for about 14 years, in 1993, I was appointed Resident Editor of Indian Express, Chandigarh and then Editor, Hindustan Times, Chandigarh. I was among the 12 journalists from the developing countries to be selected for a six-week fellowship in the US, sponsored by the American Society of Newspaper Editors (ASNE) in 1986. A four-month stint at the Programme for Arms Control, University of Illinois, USA, in 1991-92, was yet another wonderful experience. Now, after nearly 30 years in the print media, I am moving into another field - electronic journalism. I will be a part of the core team driving a television channel called Day & Night news from Chandigarh. How different it would be from the world of newspapers and magazines, I still have to figure out. I hope the "paper tiger" does not become the likes of many in the electronic media — a "peppered tiger"!